Are you interested in missions? Do you enjoy reading biographies? Reading about the lives of famous and not-so-famous people who gave their lives to reaching the unreached can be educational, inspiring, and entertaining. Here are some suggestions to get you (and your kids) started. 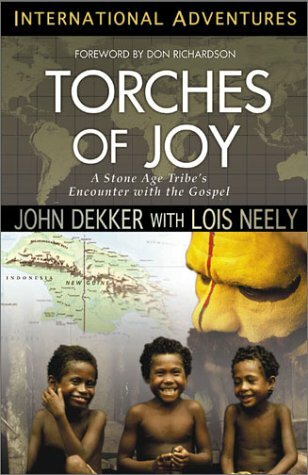 Torches of Joy, by John Dekker. Pete and I know John Dekker—he served with Pete at a local mission ministry here in Colorado. It’s hard to believe this quiet, unassuming man and his family spent years living in the jungles of Irian Jaya. The Dani tribe was still living at a stone-age level when the Dekkers arrived to bring them the gospel. Today, they’re full of joy, and eagerly send missionaries to the other tribes around them. This book is a page turner! And in case you’re wondering, yes, noted novelist Ted Dekker is John and Helen’s son. W hen God Says Go, by Lorry Lutz. We know Lorry, too. She’s a talented author, mission leader, and pretty special lady! Among her many books are several fascinating stories about various women missionaries. This one is about Mother Eliza Davis George, the daughter of an American slave. As Sherwood Eliot Wirt writes in the Foreward, “A poor little black girl growing up in segregated Texas, she made the ‘mistake’ of taking seriously the stories she learned in Sunday school.” With a burning desire to see Jesus glorified among all peoples of the earth, and with no training or support, she set out for Liberia, in west Africa. What God accomplished through this one sold-out life is absolutely incredible! It’s summer, and the following two children’s books are just right for summer vacation reading. Never Say Die: The Story of Gladys Aylward, by Cyril Davey, and D.L. Moody: God’s Salesman, by Sandy Dengler are aimed at older elementary and middle school readers. 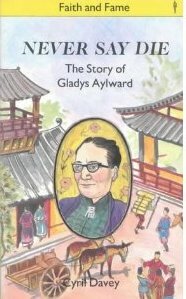 Gladys Aylward was a parlourmaid in 1928 England when she felt God calling her to China. Rejected by the mission board as being too old and too uneducated, she determined that if God had called her, no one could stop her. Indeed, she made it to China—and that was just the beginning. If you’re familiar with Moody Press and the Moody Bible Institute, you might be wondering—who was the man behind the name? A former farmer, Dwight Lyman Moody started out to make a lot of money, but he ended up making God famous instead. That’s what happens when you let God have control of your life! These books are just to whet your appetite. There’s an old adult-level biography of Gladys Aylward called The Small Woman, by Alan Burgess. I’ve read biographies about Amy Carmichael (India), Hudson Taylor (China), C.T. Studd (China, India, Africa), Jim Elliot (Ecuador), and many more. There are also contemporary mission stories, but you may have to hunt a bit to find them. The Jesus film project has written several volumes that describe how God is using this dramatization of Luke’s Gospel. Many other mission ministries have published similar works. In addition, many ministries have stories on their websites—you don’t even need to buy a book. So often my summer reading consists of entertaining, mindless fiction—the sort of book you would take to the beach to relax with. This year I’m determined to keep my brain engaged, and read some true stories that will encourage me and increase my faith. Won’t you join me? This entry was posted in Book, Faith & God, World and tagged biography, good books, mission, recommendation, suggested reading. Bookmark the permalink.